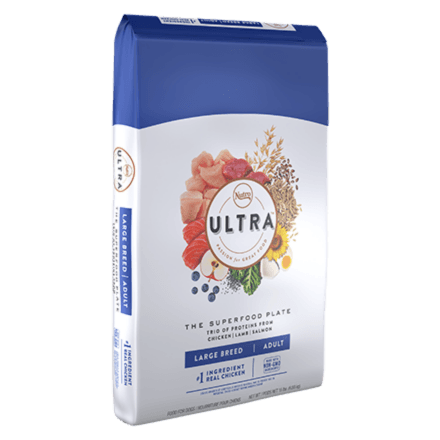 ULTRA™ Large Breed Adult Dog Food is tailored to meet the nutritional needs of large breed dogs. Our premium dog food is made with nature's finest ingredients to provide complete and balanced nutrition in every bowl while supporting a healthy heart and joints. Your dog will enjoy the unforgettable taste of premium, natural ingredients! All the “life” in your pet’s life is dependent upon how you feed them. A pet’s food energizes them from the inside out, and NUTRO’S™ clean recipes are simple, purposeful, and trustworthy – made of real, recognizable, non-GMO ingredients✝. NUTRO. Feed Clean™. †Trace amounts of genetically modified material may be present due to potential cross contact during manufacturing. Chicken, Chicken Meal (source of Glucosamine and Chondroitin Sulfate), Whole Brown Rice, Brewers Rice, Rice Bran, Whole Grain Oatmeal, Chicken Fat (preserved with Mixed Tocopherols), Natural Flavour, Salmon Meal, Lamb Meal (source of Glucosamine and Chondroitin Sulfate), Dried Plain Beet Pulp, Whole Flaxseed, Sunflower Oil (preserved with Mixed Tocopherols), Potassium Chloride, Choline Chloride, DL-Methionine, Salt, Mixed Tocopherols and Citric Acid (preservatives), Dried Coconut, Whole Chia Seed, Dried Egg Product, Tomato Pomace, Dried Kale, Dried Pumpkin, Dried Spinach, Dried Blueberries, Dried Apples, Dried Carrots, Zinc Sulfate, Niacin Supplement, Biotin, Vitamin E Supplement, D-Calcium Pantothenate, Iron Amino Acid Chelate, Riboflavin Supplement (Vitamin B2), Vitamin B12 Supplement, Selenium Yeast, Pyridoxine Hydrochloride (Vitamin B6), Copper Amino Acid Chelate, Manganese Amino Acid Chelate, Vitamin A Supplement, Thiamine Mononitrate (Vitamin B1), Vitamin D3 Supplement, Folic Acid, Rosemary Extract. Visit our Ingredient Glossary for more information. These are the recommended feeding amounts based on the ideal body condition for adult dogs of various weights. Individual dogs’ energy requirements may differ. Adjust the amount fed to obtain or maintain your dog’s optimum weight. Keep fresh drinking water available at all times, provide plenty of exercise and see your veterinarian regularly. Serve dry or lightly moistened. To help maintain freshness, we recommend sealing the bag tightly and storing it in a cool, dry location. These are the recommended feeding amounts based on the ideal body condition for adult large breed dogs of various weights. Individual dogs energy requirements may differ. ‡Use a standard 8 oz. measuring cup, which holds 3.42 oz. of NUTRO ULTRA™ Large Breed Adult Dog Food. Metabolizable energy 3562 kcal/kg, 346 kcal/cup (calculated). Feed an amount toward the low end of the range. Feed an amount toward the high end of the range. Adjust the amount fed to obtain or maintain their optimum weight. If feeding NUTRO ULTRA™ Dog Food for the first time or changing recipes, we suggest you blend increasing amounts of the new recipe with your old dog food for six days. Keep fresh drinking water available at all times. See your veterinarian regularly. FOR 2 DAYS 25% NUTRO ULTRA™ Dog Food 75% Old Food. FOR 2 DAYS 50% NUTRO ULTRA™ Dog Food 50% Old Food. FOR 2 DAYS 75% NUTRO ULTRA™ Dog Food 25% Old Food. FOR A LIFETIME 100% NUTRO ULTRA™ Dog Food. NUTRO ULTRA™ Large Breed Adult Food for Dogs is formulated to meet the nutritional levels established by the AAFCO Dog Food Nutrient Profiles for adult maintenance. Enter your email below to save $5.00 CAD off* your first bag of NUTRO™ pet food.